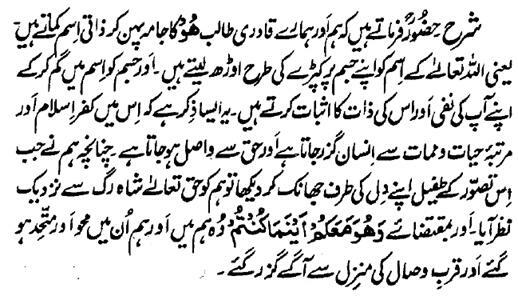 Hazrat Sultan Bahu Rahmatu-Allahe Ta-aala Alaihe says that 'we and our Qadiri Seekers wear the raiment of Hu and earn the Name of the Essence. That is, they cover their body with the Name of Allah Almighty like clothe and by making their body lost in the Name, they do the Nafi of their self and the Asbaat of His Essence. This is such a Zikr, that the human being transcends the Kufr Islam and the Martaba of life and after death and becomes Waasil with Haq. Hence, when we peeped into our heart by virtue of this imagination, the Almighty Haq was seen by us nearer to our jugular vein and in accordance to 'He is with you wheresoever you may be (57:4) ' we became preoccupied in Him and united with Him and crossed the destination of the Qurb and Wisaal.